We were so truly blessed to have UPCI General Superintendent Rev and Sis David Bernard, and our Regional Director, Bro Buckland come to PNG to minister at the Minister's & Wives Conference. There are not enough words that can describe the powerful messages taught and preached to us over the weekend, everything that taught/preached was exactly what was needed. In particular the Husbands & Wives seminar was a great blessing to our married ministers, with Sis Bernard teaming up with her husband to present words of priceless wisdom. We're going to see great changes happening in 2019! Everyone left with a renewed willingness and desire to improve their ministries and “run as Aaron ran”. 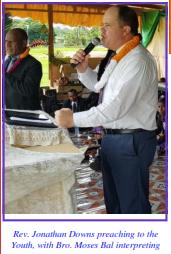 The PNG Superintendent gave a wonderful message titled "Up Come Higher" Rev 4:1. This was our Conference theme, it was a great directional message! During this weekend, the Board also appointed an Assistant Superintendent, Rev Andrew Awagl; and Administrative Coordinator Rev Jimmy Wanpis. 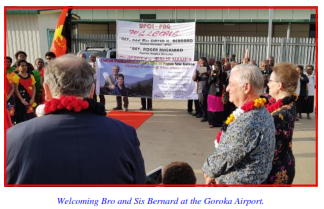 Bro Jimmy has moved to Goroka to assist with administration of the HQ in the new year. 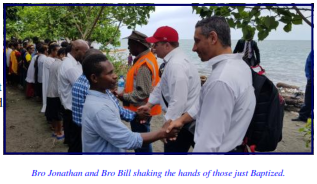 This shows some of the great changes happening in the church in PNG! These surely are exciting times!! In January of this year we were blessed to have Rev. Jonathan Downs and Bro Bill from Canberra, Australia, come and minister at our National Youth Conference. There were up 2500 people attending the services. There was a tremendous move of the Spirit with 103 Baptised and 110 filled with the Holy Ghost! Everyone walked away with a renewed dedication and a desire to serve the Lord no matter what! Especially good was our daughter, Laura, was at the altar call each service and was filled with the Holy Spirit and renewed in her relationship with God. She left with a life-changing experience!! Surely the Youth are the Church of today!! Please pray for the Youth of PNG.